The 2008 Australian Football International Cup has travelled down to Warrnambool for the crucial final round of pool matches. Based on the original seeding, top plays second in each of the four pools, which should see some great matches, and two of them are really too close to call. Rain greeted the players who arrived via two train services courtesy of V-Line. Wet and windy weather is predicted for Monday's matches, which will test even the best teams and should help the struggling sides limit the damage. 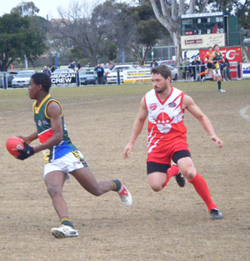 The South Africa Lions defeated the Denmark Vikings in tough conditions for football at Geelong’s Kardinia Park West Oval yesterday. With a strong wind towards the southern end of the ground, the Vikings did most of the attacking in a tight first quarter, but from then on the Lions gained the edge, eventually running out 45 point winners. Ed: Many thanks to guest reporter Marty Davies for the report and photos, stepping in at short notice to cover the match for WFN and giving our other reporter present a welcome break. Most of the international teams had heard that heading down the coast of Victoria for the next rounds of matches in the International Cup could result in wet weather footy, and that certainly looks on the cards. 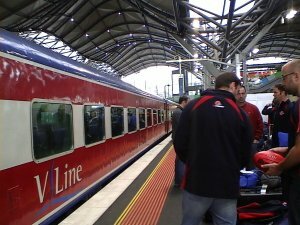 The teams made the approximately 3 hour train journey courtesy of two V/Line services, with early morning and mid-morning departures. worldfootynews.com joined the second group which included the Americans, Canadians, British, South Africans, Chinese, Indians, Nauruans and Japanese. The International Cup teams attended the Telstra Dome last night to parade at half time, and to watch a great football spectacle, if not a great game. The great expectation of seeing Hawthorn star Lance Franklin and Carlton star Brendan Fevola achieve their 100th goal for the season drew a full house of over 49,000. Franklin achieved his in the first quarter and we have no official confirmation that any of the International Cup representatives were among the approximately 5000 people who rushed onto the ground to congratulate him (though there were reports that the Samoans were amongst them). Fevola failed, just, to reach the mark himself at the end of the match, but the chance of the double kept the crowd on the edge of their seats. The Parade of Nations at half time saw all nations march out in alphabetical order (and included multicultural division teams - even Tonga whose attendance has been the source some mystery). There were some mixed responses to nations including some (hopefully good natured and based on sporting competitiveness) boos for NZ, Great Britain and the USA. The nations all assembled in the centre of the ground to be introduced before marching off again. 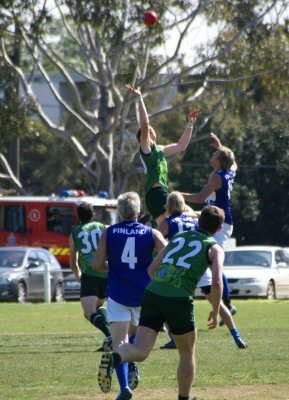 The Friday match at the Western Oval between International Cup debutante Finland, most of whom have been playing the game for around a year, and the experienced Irish team was seen as a mismatch. The scoreboard might confirm that. However, in play, the Finns, with a bumping tradition from ice hockey, harried the Irish all day, a team with its own national bumping tradition drawn from Gaelic Football. The Finns lacked both on-field tactical nous in taking the ball forward and the players who could execute in the forward line, but they kept the pressure on the Irish all day, leading to sloppy ball handling and missed passes from the boys in green. After the match coach "Izzy" Barker explained that after their big loss in round 1 the team had sat down and focussed on what each individual was going to do to stop such a blow out again. That meant harassing the Irish, forcing them wide and employing a fair bit of flooding. As was expected 2005 International Cup champions New Zealand comprehensively defeated India in their Pool A match on Friday. The Falcons dominated the match from start to finish, with the Indians struggling to get the ball past the centre. Whilst New Zealand missed their first few shots of the game, they were extremely accurate in front of goals from thereon in (almost 80% of shots at goal, were goals). 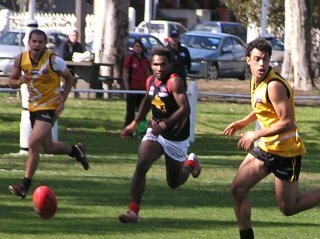 There's a growing awareness in Australia of the need to actively encourage immigrant populations to take up the great Australian game of football. In the past it was somewhat taken for granted that people new to the country would slowly embrace Aussie Rules, but these days with so many sports on offer and soccer much more established, that assumption can't be made. 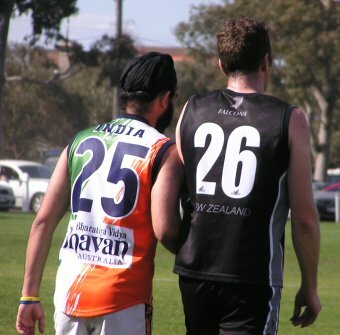 For this reason and with more lofty aims of helping new arrivals integrate into society, multicultural footy development is a growing area, especially in Melbourne (but is also likely to be a core focus for the proposed new western Sydney AFL club). This pursuit has seen four games scheduled during the International Cup as Multicultural Challenge matches, as an adjunct to the main tournament - the teams are not part of the main draw. 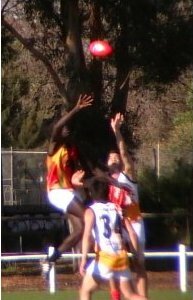 Yesterday on McAlister Oval at Royal Park in Melbourne Team Africa took on Team Asia, with players drawn from local ethnic communities. The two Yukis from Adelaide, South Australia, could be the secret weapon that the All Japan Samurais team needs to advance to the big finals of the 2008 Australian Football International Cup, which is now heading to Warrnambool in country Victoria. It was the Scott Fleming show yesterday at Ransford Oval. But don’t be fooled into thinking he was a lone hand. Both on Wednesday and again yesterday we repeatedly saw the brilliant passing of Aaron Falcioni (and other team mates) giving Fleming the best possible chance to mark out front on the lead where defenders were unable to have a say in whether he marked or not. He is not a one trick pony though - we have seen Fleming pounce on the loose ball at pace and snap goals on the run. It was Fleming who started the ball rolling early on with a mark out front on the edge of the arc. However, he had to wait some five minutes to take the kick as Sweden’s full back Mattias Fagersson, who was knocked out falling heavily in a previous marking contest, had to be treated by medical staff and was later taken to hospital. Fleming restarted the game with a solid boot for maximum points. South Africa take on Denmark at Kardinia Park West (St Marys FC) in Geelong to complete round 2 of the 2008 International Cup today, 12pm AEST. Quarter by quarter live scores will be updated here. Great Britain has been brought back to reality following their 127 point victory over the Peace Team on Wednesday. Nauru’s Chiefs beat the Bulldogs by a comfortable 47 points, although the game was much more competitive than the score suggests. The match took place on the most-central of the three ovals, Ransford (it was originally scheduled at Western Oval) as it was the most evenly-matched game of the three that started at 11am. Conditions were great for football; sunny, mostly blue skies and minimal breeze. A good crowd gathered to watch and support the PNG and Peace teams in the 1.00 pm Round 2 match, almost as big as the crowd across the road watching the contest between Japan and Samoa. Some of the visionaries of football, and now international football luminaries, of the Victorian kind, including Ron Barassi and Brian Dixon, were amongst them. It was inevitable that the novices of the Peace Team, drawn from Israelis and Palestinians, including some African residents, even with the coaching of the Big Dipper, Robert Dipierdomenico, would struggle against the athleticism and football skills of the PNG team. It was a hard fought but friendly match, with no quarter given.